After last year's attempt at cider making produced Rocket Fuel I decided to go back to the basics and attempt a plain, lower alcohol (it still reached over 7% ABV) cider this year. This batch also served to propagate yeast for my ice cider, which I finally bottled a few days ago. The first change I made was to go with a pack of Wyeast's Cider yeast instead of bread yeast. I felt like after two less than terrific attempts at cider making it was worth trying a yeast that was actually selected for it. Next I left out the apple butter, since it just added sediment and not much apple/spice flavor. Instead I just went with high quality local apple cider from a farmers market, pasteurized, but preservative free. I took some great tips from a cider making website called Lost Meadow Orchard and Cidery. The main thesis of the site is that making cider is not that similar to making beer. The author advocates using low temperatures, low aeration, and low nutrient juice to force a long slow fermentation which he has found preserves more of the apple character than a strong fast fermentation. I did not take his advice in full (I didn't have that sort of time or juice) but I did skew my technique in that general direction. I didn't add any sugar/malt/honey to this batch so the alcohol would not get out of control. Well that isn't entirely true, I did add a 1/4 lb of lactose at bottling to add back just a bit of body and sweetness (the cider originally fermented all the way down to .996). I also decided to solve my cloudy cider issue from years past by adding a couple teaspoons of pectic enzyme (1/2 tsp per gallon as instructed on the package). Pectic enzyme breaks down the pectin in the pasteurized cider (pectin is activated by heat and is responsible for the fruit gel we call jelly). I added the pectic enzyme shortly after I pitched the yeast, ideally I would have added it a few hours before the yeast, but I bought the cider before the enzyme and wanted to get the cider going. Despite this the enzyme worked giving me a brilliantly clear cider. I'd suggest that anyone who wants to try their hand at making an alcoholic beverage begin with a cider. Starting a batch takes no more than 15 minutes including sanitation and clean up, and the only equipment you need besides something to ferment it in (a carboy/bucket) is bottling/kegging equipment. Appearance – Stunningly clear golden yellow, with some carbonation visible. The pectic enzyme certainly did its job chasing away the haze, but I wonder if I used more than is really needed (I have since read that the amount I used can cause a "fishy" off flavor). No head/lacing, but that is to be expected in cider where there is no proteins to form a foam. Smell – The aroma is very subdued, just a hint of fresh apples and not much else. As it warms there is some alcohol, but it is not enough for me to call it hot. Taste – Crisp (slightly tart) apples and a hint of sulfur/yeastiness (pectic enzyme?). Bone dry, although not to the point of being unpleasant. The flavor is fine, but the apple flavor doesn't pop like I want it to. To get more apple flavor next year I could try to keep the fermentation cold longer, or find some fresher/unpasteurized cider from a local cider presser. Mouthfeel – The body is pretty thin, but it does not seem watery because of a light tannic roughness on the tongue. The carbonation is moderate, prickly, but not as strong as I intended it to be. 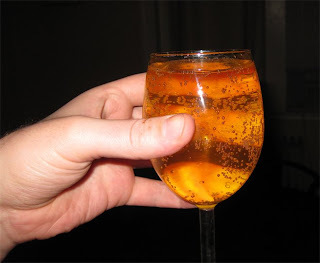 Drinkability & Notes – It is certainly more wine like than most commercial ciders that I have had, which tend to be sweeter, weaker, and bolder. This is not a particularly complex or interesting cider, but it is still pretty young (10 weeks since I "brewed it") for a cider so it will probably continue to improve for awhile to come. 11/08/08 Added 4 gallons of pasteurized cider from the Arlington Farmers Market to a carboy, added an inflated pack of yeast. The only aeration was the splashing while pouring the cider into the carboy. Put it into the chest freezer @ 55 degrees. Added the pectic enzyme 1 hour after the yeast. Small dots of yeast on the surface started to appear after 36 hours. 11/11/08 Decent krausen and activity, hopefully it can keep fermenting even though the freezer had to be dropped to 48 degrees for the lager. 11/16/08 Only down to 1.040. Moved it into the closet to let it warm up. It would probably have eventually finish in the fridge, but I don't have the time to wait. 11/26/08 Transferred to secondary, down to ~.996, very clear. 12/13/08 Bottled with 4.25 oz of cane sugar and 4 oz of lactose for a bit of sweetness/body. 5/16/09 Grabbed a third place (out of 9) at the 2009 Spirit of Free Beer, not bad for a cider I am not completely happy with. I brewed a batch in october and added a small amount of pectin enzyme too. It is still cloudy after all this time. I split the 3 gallon batch three ways ( one with a oak cube in bandy, one plain, and one with lactose to back sweeten) and wanted to know what you think about adding more pectin enzyme at this point, or adding something like sparklanoid? Sounds like an interesting way to divide 3 gallons of cider. How much pectic enzyme did you add at the start? If you added less than the manufacturer recommended amount you could certainly add more, but from what I have read after fermentation it is considerably less effective. Could it just be yeast in suspension? What strain did you use? If it is the yeast cold storage and a fining like sparkaloid or gelatin might be the best way to go. Good luck, and remember it is just appearance, so if it tastes good don’t worry about it too much. The Jamil show ( http://thebrewingnetwork.com/shows/The-Jamil-Show ) just did a few shows about cider that were helpful to me. He also suggested the slow, cold fermentation... but above all, he said FRUIT QUALITY/VARIETY makes all the difference. I just racked a 2.5 gallon batch to secondary. I used 2 gallons of pasteurized cider and a half gallon of "Cherry Cider". I fermented it around 64 degrees for two weeks and dropped down to about 1.003. It is a little thin, so adding lactose seems like the thing to do. It is good to read that the technique I came around too on my own is not too far from what other people are doing. 10 weeks is a little young I would sit on it for another few months at a minimum and you will see a drastic change in flavor and complexity. I have a batch of cider on tap in my keggerator that is at least 6 months old and it still has some ways to go. My buddy brendan left a little jug of cider in his fridge since October. I noticed it there this past weekend, swollen to its limits. I knew instantly he had 1. a ticking time bottle bomb 2. some really foul stuff 3. some palatable hard cider. Turns out it was the 3rd. After a four month cold ferment, the resulting cider was a touch sweet still (maybe not fully fermented), but perfectly carbonated and incredibly apple-y. So, while I would not recommend this as cider making methodology, I'm definitely a +1 on thinking that cold fermentation temps really preserves the flavor profile. And incidentally, the clarity was pretty darn good. I made two batches of cider this year using unpasteurized cider. To one I added molasses, raisins and champagne yeast to ferment. The more interesting batch turned out to be the gallon I put in a sanitized fermenter by itself to see what happened. Fermentation started after a couple weeks at about 60 F and finished after two months. It even cleared without any pectic enzyme. I don't have a FG reading but its fairly dry, slightly appley with a faint sulfur aroma. Folks who are interested in making Cider should check out the Cider Digest, which is an email list for Cider makers. Regular contributors include professional cider makers as well as knowledgeable amateurs. Although the discussions often get pretty technical, it's a friendly place where everyone is very happy to help newbies. To be real honest, I find that WYeast 3766 Cider leaves pretty generic, and bland tasting ciders...personally (although this might sound weird), I have had fantastic results with Nottingham Ale yeast. Agreed, but I would imagine that if you had really great cider (cider varieties, unpasteurized, fresh etc...) that bland might be exactly what you are looking for. This year I went with a blend of sour beer microbes and a hefeweizen strain, should be more interesting. I'm going to a cidery this weekend and getting 5 gallons of fresh cider pressed specifically for making hard cider. Of course, it is not pasteurized. Do I need to use campden tablets or worry about heating it at all? If I pitch yeast pretty soon after the cider is pressed do I need to worry about pectic enzyme? I don't have any experience with raw cider. That said, if it was me, I wouldn't kill the microbes. Cider will ferment pretty dry regardless, and a few funky notes would only add to the character (for me). I believe that pectins are set by heat, so if it hasn't been pasteurized you shouldn't have to worry about haze too much.